Spring: My Top 10 Lip Colours for Spring! 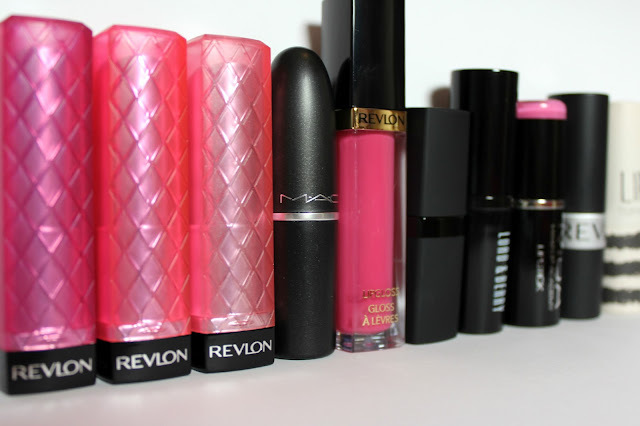 Revlon Lip Butters: I won’t go into detail here because I have already reviewed these colours, if you are interested in ready/watching my review see here. These three shades are so versatile and are so perfect for spring! Lollipop is a beautiful dark berry pink with blue undertones that is the most perfect lip colour when you are feeling for confident. Sweet tart is a beautiful medium pink with is a little lighter that the Lollipop so great for when you don’t feel as brave but want a nice pop of colour. Last but not least Strawberry Shortcake which is a gorgeous muted baby pink which is perfect for an every day lip colour. MAC Watch Me Simmer: This is such a pretty coral colour and is basically spring in a tube for me! The formula is amazing and beautiful to apply, the pigmentation is out of this world! Revlon Lip Gloss in Pink Pop: This is a perfect girly sheer pink for a lovely wash of colour on its own to teamed with another lipstick to create a custom shade, I particularly like to team it with Barry M’s 147 for a really pretty peachy coral colour. Barry M 147: This is a peachy pink colour with amazing pigmentation and a matt/satin finish. This is a very strong colour and I like to tone it down with Revlon’s Pink Pop on days where I don’t want such a bright lip colour. This is my favourite Spring/Summer colour so far and I can see myself wearing this combo a lot! Lord and Berry 60s Pink: This is such a pretty bright almost bubblegum pink colour which is so perfect for the Spring and really helps brighten up your make up. I like the finish of this lipstick, it is somewhere between a glossy and satin finish which is really beautiful. MUA Lipstick in Shade 4: This is a very sheer baby pink colour that applies like a dream! It is almost like applying water to your lips (obviously without it running everywhere but you get the idea) it is so hydrating and glossy. Quite similar to the Revlon Lip Butter in Strawberry Shortcake but more glossy and more sheer. Revlon Matte Lipstick in Pink Pout: This is a light muted pink with a purple/mauve undertone to it. I always get compliments when I wear this! The matte finish means you need flawless lips to be able to pull this off so a lip scrub and balm beforehand is a must but it really is a beautiful colour. Topshop Lipstick in Innocent: This is pretty similar to Revlon’s Pink Pout only the finish is more glossy and it is slightly less muted. I have a bit of a love hate relationship with this lipstick, I love the colour and application but I hate the smell! So those are my favourite for the coming Spring! What are yours? "Review: Chanel Rouge Coco in Rose Dentelle"